Asian people love roasting meat and putting it over rice. It's probably coded into our genetic material or something. Roast meat + rice = delicious. In Taiwan, if you walk around, every one of the 燒臘 places claims that they have Hong Kong style roast meats. So naturally I thought, man... the food there must be the pinnacle of roast meats and rice. When I arrived in HK though, everything said their food was 台式口味 or basically 'Taiwanese flavored.' I was thoroughly confused. If Taiwanese people want to cook like HK people, and HK people wanted to eat Taiwanese cuisine... which is better? I had to do some investigating. Also I was hungry. I think the above plate was 30 HKD (just short of $4), which is kind of expensive compared to Taiwan, and pretty damn cheap when compared to NY (in this, I also came to the conclusion that HK is basically what would happen if Taipei collided with NYC, but in Cantonese). Impressed by the bright red radioactive hue emanating from my strip of pork, I was pretty overjoyed when I tasted it. The char siu that this shop makes isn't made with loins as normally expected, but rather a cut of pork belly. Half fat and half meat might seem disgusting and overwhelming, but quite the opposite is true. A delicate crust formed by the caramelizing of the maltose leads to a crispy layer that is basically fried in pork fat whilst roasting. The meat remains tender and juicy (without question due to the fat content). Slice and throw this over rice (+ greens for more color) and you have an undeniably satisfying meal. Now... back to that age old (in my mind) debate over meat roasting superiority? Mmm, this round goes to Hong Kong, but I'm not convinced that there isn't truly tantalizing roast meat in Taiwan either. I probably haven't been looking hard enough. PS - if you're intoxicated by the unnatural red color too... 源記粥麵 is located in the middle of Kimberly Road. Y'ups... thanks! My Chinese is pretty god awful when it comes to writing/reading haha. So if it's expensive compared to Taiwan... how popular is it in HK? 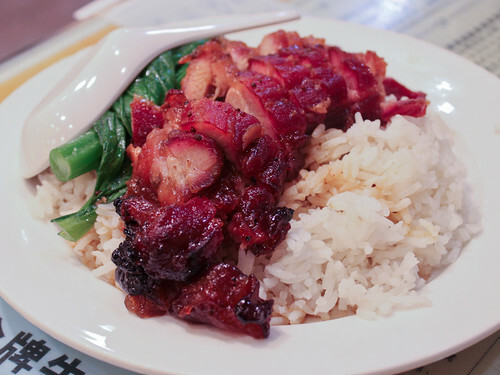 Is it expensive relatively to other char siu over rice? Have you been to that place in Chinatown where it's like $2.50? Ridiculous. The thing is, salaries in Taiwan are ridiculously low relative to a lot of Asian countries (which is why I'm still perplexed as to how most people in Taiwan are so damn wealthy), so it's probably not expensive to someone living in HK. Just like how I won't complain about a $6 bowl of beef noodles in NYC, but will rarely give that a second look here. As for it's popularity, there's multiple roast meat places on every street... it's like Heaven. And $4 is pretty pricy for a common chop on rice! They must have like, wall decorations and a semi-clean bathroom or something.